Highway 234 Of course this is the road UP the mountain. Still another fabulous ride. 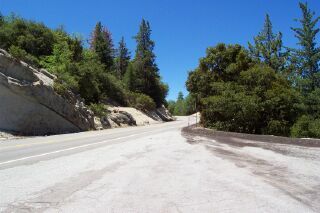 30 miles of great roads for riding UP and then another 30 back down the other side. 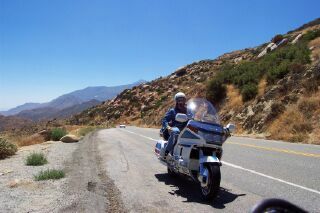 It starts in the town of Banning which is about 45 miles away. 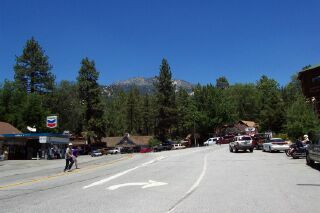 Idyllwild Downtown Idyllwild. There is more to the town then what you see here. It is first of all very pretty but there are a lot of places to eat and of course shop. At the restaurant he waitress says to us where did you drive up from. In other words everyone there drive up from somewhere down below. The elevation is around 6,000 ft. It was about 80 degrees and very comfortable. On the way down we drove though the Temecula valley and it had to be 100 degrees. 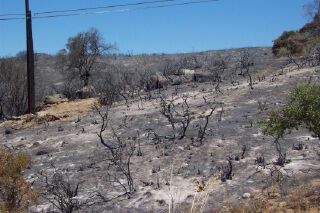 There was a fire 2 days earlier called the Banning fire on the news. Maybe cause Banning is the nearest town. It is quite amazing to see this and also how quickly nature revives itself. In other areas you can see where maybe there was a fire a few years earlier.